It's a Fort Bragg tradition, right around each Fourth of July. Make for Mendocino County and help support the Salmon Restoration Association at the Saturday, July 1 fundraiser. 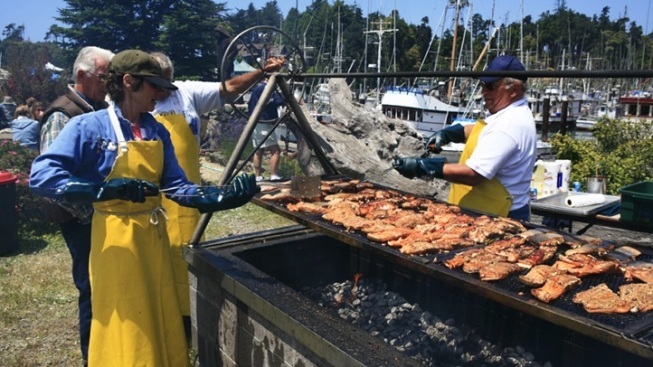 WORLD'S LARGEST SALMON BBQ... highlights the group's work, while gathering together a bunch of salmon fans for an old-school cookout, one that takes place close to the water. The 2017 feast will happen on Saturday, July 1, and an adult ticket is $25, plus an additional service fee. How will that money be used? It will "...fund actual restoration of legacy logging and development scarred streams and rivers, as well as community education." Summoning back salmon is an important goal, and while discussions of baking methods and complementary sides are popular among fish-minded chefs, caring for the fish population from the outset takes the front seat. For more info, on both the Fort Bragg barbecue and what the organization does, swim over here.